Today, we begin on yet another journey with MapsofWorld, this time to some of the most beautiful cities around the globe. What sets these cities apart is not only their beauty, but the fact that they have been favorites of tourists from around the world. The United Nations World Tourism Organization, in a report of the most visited cities, found that in 2012, over 1,035 million tourists ventured out on international trips. France, the United States, China, Spain, and Italy were named the preferred international travel destinations for 2012. About 83 million tourists visited France, while the US and China received about 67 million visitors. China and Spain tied for third place with 57.7 million visitors each, followed by Italy, with 46.4 million. Did 1,035 million people take international vacations in 2012? Leisure tourism does account for a sizeable portion of those international travel numbers. Most avid travelers believe that travel makes a man and builds character. As Mark Twain famously said, “Travel is fatal to prejudice, bigotry, and narrow-mindedness.” Globetrotters know that travel is much better than reading a book and just imagining the many wonders the world holds. Now, air travel has made it possible to reach just about anywhere on the globe in about half of a day. Modern families tend to schedule vacations around holidays (especially summer or winter breaks), avid travelers prefer off-season travel to avoid crowds and take advantage of flight and hotel discounts. Business and international trade are the next most common reason for travel. Multinational organizations, international partnerships, and collaborative ventures have made travel a necessity for many. Religious travel and international pilgrimages are another popular reason for travel. Medical tourism has gained popularity over the last decade, making inexpensive and better quality medical treatment within the reach of ordinary people. 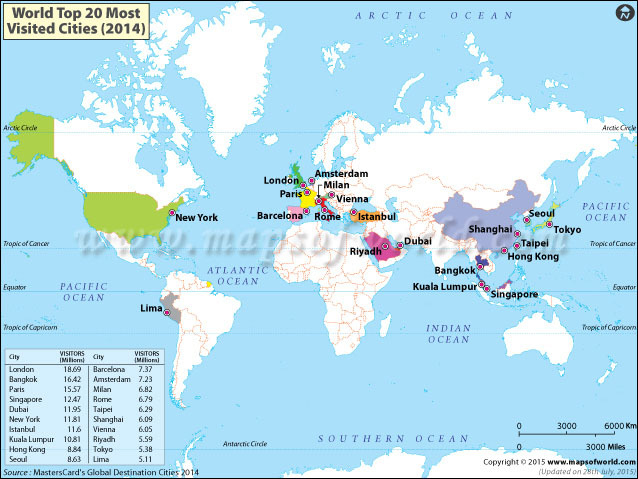 In this series, Most Visited Cities in the World, MapsofWorld will go over the top 20 most popular travel destinations in the world. In each article, we'll explore all aspects of one city – from its history and geography, to the best season to visit, and a detailed guide to the attractions that have made the city a top travel destination. We'll also provide a summary of some of the best activities to participate in during your trip, and a handy list of Fast Facts about the city – important information for planning the best trip. We'll also suggest some well known and highly rated restaurants and hotels in the area. That said, the pleasure of travel is to discover that quaint local eatery that no guide suggests, but locals love. What are the most visited cities around the world? What is it that attracts millions of visitors every year? What is the best time of year to visit these cities? Which attractions must make it into your itinerary? What are the best places to stay, eat, and drink? Let MapsofWorld answer all these questions for you on our tour of the world's most visited cities.